If you've ever spent time in the far reaches of the U.S., you're probably familiar with the deer stand—a uniquely improvised, homemade shelter that gives hunters refuge, warmth, and a clear view. Though they're designed to be inconspicuous, photographer Jason Vaughn seeks them out, finding and photographing dozens of the structures across rural Wisconsin. Vaughn is a Madison, Wisconsin-based fine art photographer whose work focuses on life in the Midwest. 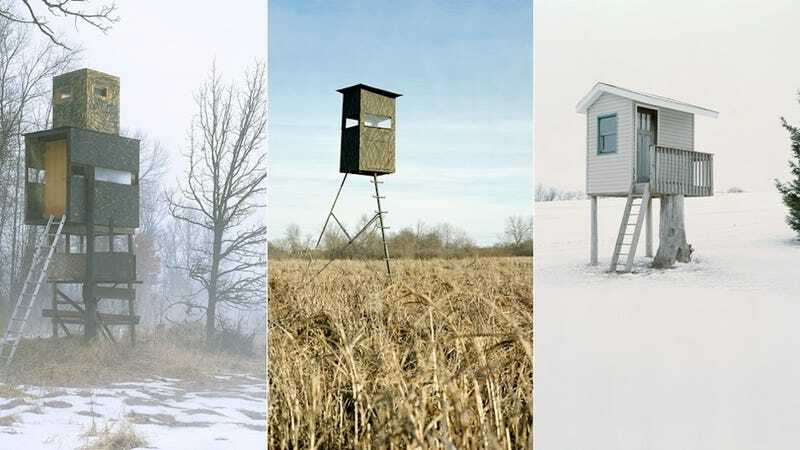 For a project called Hide, he wanted to document the unique architecture of deer stands around the state—from haphazard plywood shacks to snug, fully-outfitted homes on stilts. "It began as a commentary on Wisconsin's hunting tradition, using deer stands as a metaphor for the changing values of the sport," he explains. Hunting is declining in Wisconsin and across the Midwest—and with it, so are the often very elaborate deer stands that have been passed down through families for generations. But midway through the project Vaughn, then 32 and the father of a three month-old child, was diagnosed with Leukemia—and Hide began to take on other dimensions. Some people described building the stands as something permanent that could be passed to the next generation, especially sons who would inherit the land... Having to face mortality to unexpectedly made me come back to the project with a new perspective on the ideas of permanence and impermanence. Ultimately, Hide became my reflection on legacies and family, my homage to the state that has become my home, and a narrative about accepting change.